Despite US crude oil stockpiles remaining close to their record highs for a fourth week, crude prices spiked 5% higher in overnight trading in the US. 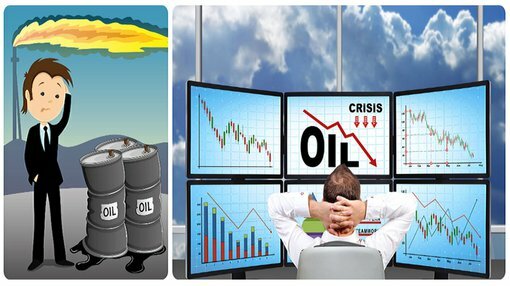 In a keenly awaited announcement by oil traders, the US Energy Information Administration (EIA) said crude stockpiles rose 3.9 million barrels to nearly 522 million barrels, in line with consensus estimates from top analysts surveyed by Reuters. Gasoline inventories fell by 4.5 million barrels, significantly worse than the 1.4 million barrel decline expected. A large draw in US gasoline inventories was seen by some analysts as confirmation that energy demand was starting to improve in North America. Meanwhile, large oil producing nations including OPEC are rumoured to be considering an output reduction to help prices recover further. 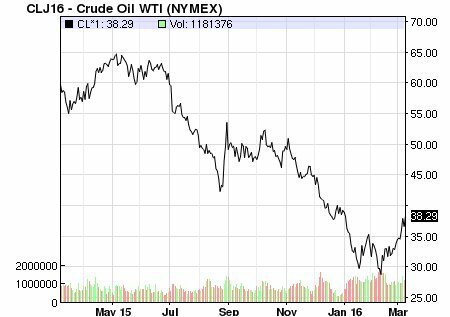 US crude futures settled US$1.79 higher, or 4.9% at $38.29 a barrel in the US trading session overnight. Brent crude futures rose $1.29 to $40.94 a barrel, having already touched three-month highs on Tuesday above $41. Prior to the publication of the latest crude oil inventory numbers, crude prices received a bid after an oil official from the Iraqi oil ministry revealed that a major meeting between the top oil producing countries would take place on 20 March in Moscow. Market participants jumped on the development as a possible early indicator for an output cut. Several hours after the rumour was picked up by international news agencies, the alleged meeting has still not been confirmed by the Russian energy ministry or any other official sources. Since mid-February, crude oil prices have risen 25% on the back of an agreement between Saudi Arabia, Qatar, Venezuela (OPEC) and Russia (non-OPEC) to leave supply at January’s levels. In February’s oil market report, the EIA said that 550 million barrels could not be accounted for and were therefore “missing”. According to Reuters and the International Energy Agency (IEA), global oil production exceeded consumption by just over 1 billion barrels in 2014/15. Production exceeded consumption by an average of 0.9 million barrels per day in 2014 and 2.0 million bpd in 2015. Of the 1 billion barrels reportedly produced but not consumed, roughly 420 million are being stored on land in member countries of the Organisation for Economic Cooperation and Development (OECD). Another 75 million barrels are thought to be stored at sea or in transit by tanker somewhere from the oil fields to the refineries. When tallying up the ‘miscellaneous’ items that reflect data errors in IEA’s reporting, it would appear 550 million barrels of oil have not been accounted for, and therefore, could come back onto the market once statistical disparities have been ironed out. 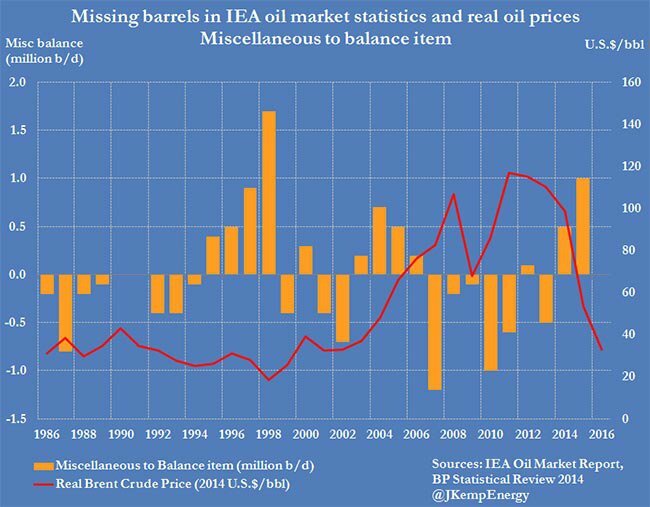 The last time the miscellaneous balance item was this large and positive (implying an oversupplied market) was in 1997/98 when the issue triggered fierce criticism of the IEA’s statistics. Critics accused the IEA of over-estimating supply, under-estimating demand, contributing to perception of a glut, depressing prices, and causing unnecessary hardship to the oil industry. In an article published in November last year, The Financial Times (FT) reported that the “amount of oil at sea is at least double the levels of earlier this year and is equivalent to more than a day of global oil supply”. The falling oil price over the past few years has effectively created an ‘in-transit glut’ that acts as an additional downside pressure on prices. In the article, the FT estimated that Asia’s main oil hub had around 35 million barrels stuck in transit, the US Gulf of Mexico has 20 million barrels and UAE 8 million.